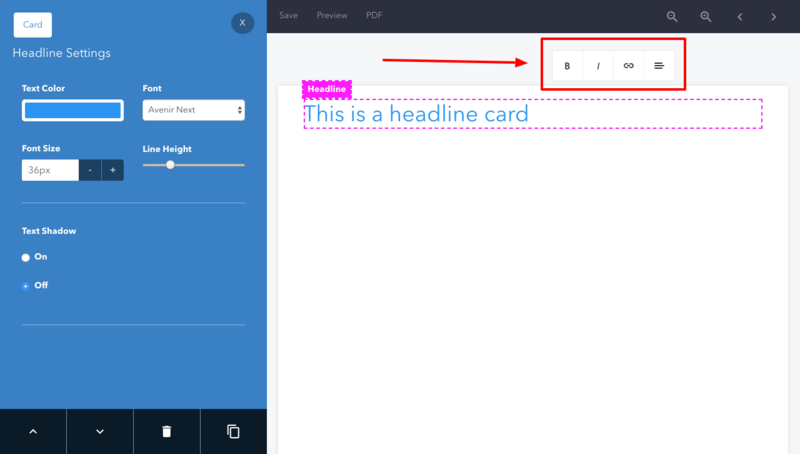 The Headline Card should be used when you want to add a short title to your page. Headline cards cannot be used to add text elements like lists or tables. To add these elements you should use a Text Card. Choose the color of the text within the Headline Card. Choose the typeface that will be used for the Headline Card. Increase or decrease the size of the text within the Headline Card. If your headline text flows onto several lines you can increase or decrease the spacing between the lines with this setting. Drag the slider left to decrease line height, drag the slider right to increase line height. Use this setting to add a shadow behind the headline text. This is helpful for making the headline text stand out against the background. Particularly useful if the text appears directly on top of a photographic background.